When it comes to simple game design, it doesn't come much more basic than Blitz. Based on an Atari 2600 game called Canyon Bomber released back in 1977(! ), the primitive concept of the original involved a constantly descending and non-controllable aircraft flying across the screen and dropping bombs on the pillars of rock below, with the goal being to clear the ground so that the player can can land safely. Exciting stuff, wouldn't you agree? Looking back, its clear to see that the replacing of 'boring rock towers' for 'populated skyscrapers' in Commodore's multi-platform clone/rip-off was nothing short of genius. Children around the world rejoiced at the prospect of playing a game where they could level an entire city, and this combined with it's addictive one-button gameplay resulted in Blitz becoming a massive success. Over the years I've played dozens of Blitz clones on a wide variety of systems; it's very simplicity makes it a perfect 'first project' for many coders and I even recall seeing BASIC listings for the game printed in old magazines as a tutorial program. 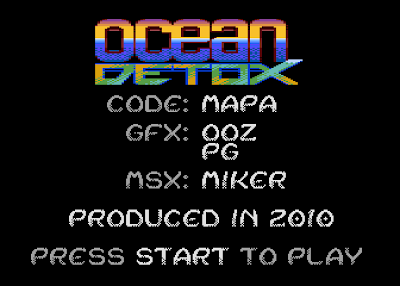 So understandably, when I came across Ocean Detox for the 8-Bit Atari back in 2010 I made the mistake of immediately dismissing it as 'another Blitz game', which is why it took me until just recently to begrudgingly fire it up in an emulator. Now, a couple of hours after first loading the game and much to my own amazement, I'm still playing it. In fact, Ocean Detox is currently running in the background while I'm typing these very words, waiting for me to finish this paragraph so I can return for another quick attempt at beating my previous score. 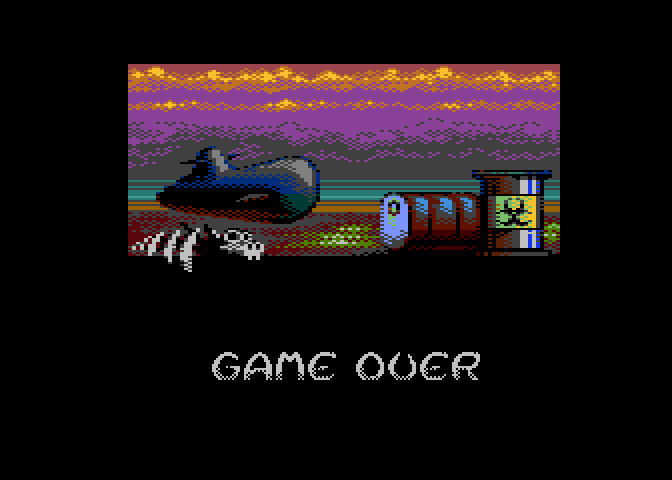 As you've probably established from the title and screenshots, Ocean Detox is a Blitz clone set in the ocean, with the player's submarine responsible for 'neutralising' mountains of toxic barrels irresponsibly dumped on the seabed. This is of course achieved via the somewhat improbable practice of dropping depth charges on them from above (and I'm sure that Greenpeace would have a few words to say about that). Your standard-issue anti-toxin mines can destroy up to four barrels per hit, and with only one mine allowed in play at a time, some very accurate shooting is required in order to beat the game. Besides the top-quality presentation, this ABBUC competition-winning release has a few tricks up it's sleeve in the form of a variety of power-ups and bonuses that give the game a surprising depth (excuse the pun). In fact, there's a fair amount of strategy involved - unlike the original, it's not simply a matter of trying to drop bombs on the tallest towers with each pass (although that obviously helps). In addition to fast-falling mines and 'mega-mines' that destroy an entire column, there are also shields and point bonuses on offer as well as pickups that temporarily pause your sub or even raise it a level to give you some extra space. Then there's the dreaded speed-up and score-reduction non-bonuses to avoid as well. With such limited time to choose your shots, you end up frantically juggling between collecting the useful bonuses, avoiding the bad ones and lowering the towers each and every pass - and as a result it's a simultaneously stressful, challenging and enjoyable experience, which is exactly what an aracde style game should be. 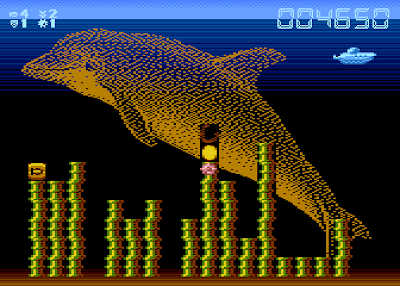 The downside of this added complexity is of course the fact that the Atari joystick only supports one fire button, so you end up with the quirky control combination of fire to drop regular mines, right on the joystick to fire a torpedeo, up to drop a mega-mine and down to release a fast-mine. With the game being so hectic, I can't help but feel that these power-ups could have been implemented better and that the game should have been kept as a single button affair (although right to fire a torpedeo does seem to make sense). Instead of this non-intuative system, I imagine that simply loading your next shot with the currently held power-up would have been easier to handle, despite it reducing the strategic element of the game. Additionally, it's not obvious on your first few plays what the pick ups actually do until you've collected them a few times and memorised their abstract icons. 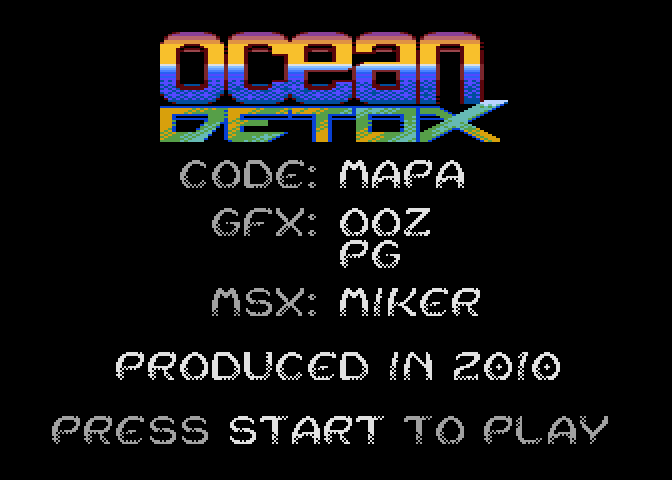 An instruction screen detailing these would have helped make Ocean Detox more immediately accessible, as would perhaps colour-coding the positive and negetive bonuses. 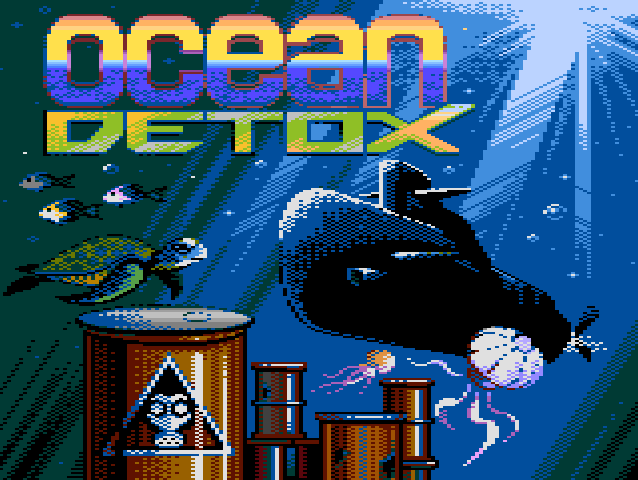 However, despite these minor points and it's simple core design, Ocean Detox is one of the best modern releases I've played on the 8-Bit Atari and certainly worth adding to your collection. Download the game here (from Fandal's website).